Bryan Eisenberger serves as Vice President at Gans Ink. 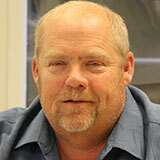 Bryan has over 36 years of printing ink manufacturing, sales, and R & D experience. He started in the ink business in 1980 at Summit Ink a small family owned ink company which specialized in inks for McDonalds Styrofoam containers. After working is way up from production to the lab Bryan then took a job as a manager for a plant in Eugene, Oregon. He was also the General Manager for Corac and then he worked for the House of Packaging where he set-up their in-house ink operation. In 1990, Bryan was offered a Branch manager position with Gans Ink in Salt lake City, Utah. Then in 1994 he was promoted to Regional Manager to include the mountain states and our Salt Lake City and Denver offices. Bryan continued grow with Gans and in 1997 he was promoted to V.P. of Manufacturing and began overseeing the operations at all 12 Gans Ink locations. In 2011, he moved back to Los Angeles with his wife of 27 (wonderful) years where he currently oversee all aspects of the day to day business of Gans Ink as Vice President. Bryan has 3 grown children: Marty, Christine, and Michael. He also has one grandson, Ryan Thomas. When Bryan is not working he enjoys the outdoors especially hunting and fishing. He is looking forward to taking his grandson out to his first fishing trip.